Britain’s vote to leave the EU has added a new layer of complexity to the process of strengthening European security. It coincides with a chilling of the transatlantic relationship following the election of Donald Trump as US president; persistent Russian probing of the political and military resilience of European governments and societies; and the intensification of radical Islamist terrorist threats within Europe and a chaotic Middle East. In this sense, Brexit could not be timed any worse. The decision has caused understandable resentment among European leaders, as evidenced in Michel Barnier’s remarks in Berlin on Nov. 29, 2017: “Rather than stand shoulder to shoulder with the union, the British chose to be on their own again.” These are harsh words that do not reflect the past, current or planned British contributions to European security. However, whatever arrangement the British government strikes with the EU27 after its withdrawal, each side will lose important levers of diplomatic influence. The UK has the largest defense budget in the EU, one of Europe’s most skillful and widespread diplomatic services, and a top-tier secret intelligence service and communications surveillance capacity (GCHQ). It is a world power in development assistance, a permanent member of the UN Security Council and a recognized nuclear power. These attributes do not automatically translate into EU capabilities or into British leadership on European security. 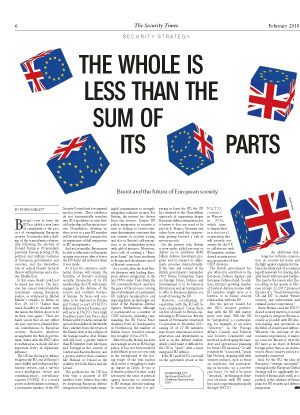 Nonetheless, drawing on these assets as a non-EU member will be sub-optimal compared to its experiences of full integration in EU arrangements. And yet, ironically, Britain may be able to offer more to European security in practice after it leaves the EU than it did in theory when it was inside. As it has for centuries, continental Europe will remain the frontline of Britain’s national security. Irrespective of its EU membership, the UK will remain engaged in the defense of the eastern and southern borders of Europe. Its forces will continue to be deployed in Estonia and Poland as part of NATO’s Enhanced Forward Presence and will serve in NATO’s Very High Readiness Joint Task Force. And Britain will try to help contain the spread of instability in the Middle East, whether from the return of the Islamic State or the collapse of the Iranian nuclear deal. Britain will still have a greater interest than EU member states like Spain and Portugal in the security of Central and Eastern Europe, and a greater interest than countries like Finland or Poland in the stability of North Africa and the Levant. The problem for the UK has been that a majority of EU member states believe that only by deepening European defense integration will they make meaningful commitments to strengthening their collective security. For Britain, the instinct has always been the reverse. Deeper EU policy integration in security is seen as leading to lowest-common-denominator outcomes that run counter to resolute action, and also to Britain’s self-perception as an independent power with global interests. Moreover, loose talk of creating a “European Army” has been anathema to Britain and the ultimate proof of Brussels overreach. As a result, after the brief British flirtation with leading European defense integration in the late 1990s under Tony Blair, the UK consistently threw sand into the gears of this process, vetoing the establishment of a permanent EU military headquarters and imposing limits on the budget and remit of the European Defense Agency. Furthermore, although it participated in a number of CSDP missions, including commanding the EU Naval Force Atalanta from its headquarters at Northwood, the number of British forces involved remain low (roughly 150 in 2017). More broadly, Britain has been increasingly absent in EU foreign policy. It has not been involved in the Minsk process; it was only in the background of the closing stages of the Iran nuclear deal; and it is struggling to make an impact in Libya. It was as if British political leaders could not muster the sense of political agency necessary to contribute to EU strategic decision-making. In contrast, now that it is preparing to leave the EU, the UK has returned to the Churchillian approach of supporting deeper European defense integration, for it knows it does not need to be part of it. France, Germany and others have seized this opportunity, putting forward a raft of new proposals. On the positive side, Britain is now under added pressure to deliver on its ambitious $248 billion defense investment program and to expand its diplomatic presence internationally. If the tone and content of the British government’s September 2017 Future Partnership Paper on Foreign Policy, Defense and Development is to be believed, Britain may end up having more to offer to European defense as a result of leaving the EU. However, coordinating its capabilities with the EU will be more complicated. Today, there are few obstacles to Britain contributing to EU missions. But the launch of Permanent Structured Cooperation in December 2017 among 25 of 27 EU members may lead to innovations in force generation and deployments as well as in the defense market, which could make it difficult for the UK to “dock” with a more integrated EU defense. If the EU and NATO can build on the agreement struck at the N A T O s ummi t in Warsaw in 2016, which aims to deepen their institutional cooperation, this will provide one avenue for the UK to collaborate with EU members on their shared security priorities, irrespective of how CSDP develops. The British government has also offered to contribute to the European Defense Agency and European Defense Fund. In addition, Britain’s growing number of bilateral defense treaties with EU members might serve as a buttress to its future security relationship with the EU. But the precise model for the UK’s security partnership with the EU will matter more over time. Will the UK be “integrated,” i.e. participating, for example, as an active “observer” in the Foreign Affairs Council and Political and Security Committee and involved in developing the mandate and operational planning for future EU missions? Or will it merely be “associated,” much like Norway, aligning itself with security policies, such as those on sanctions, and participating in missions on a case-by-case basis? Or will it be more “detached,” privileging its bilateral relations with EU members and cooperating principally through NATO? An additional challenge lies in future cooperation on counter-terrorism and the fight against organized crime. Here, the likely lack of a common legal framework for sharing data after Brexit will raise new hurdles. This may be the reason why Theresa May, in her speech in Florence on Sept. 22, 2017, proposed the idea of a “treaty between the UK and EU” to enable “future security, law enforcement and criminal justice cooperation.” Given Britain’s and the EU27’s shared security interests, it would be logical to integrate Britain as closely as possible with EU decision-making and operations in the fields of security and defense. Whatever the outcome of the economic negotiations, it makes no sense for Britain to treat the EU more as an object of British foreign policy than as an institution to whose security policy it is intimately connected. And, for the EU, the idea of European “strategic autonomy” envisaged in the European Global Strategy will be significantly less feasible if Britain pulls itself, or is pushed, to the sidelines of future plans for EU security and defense integration.